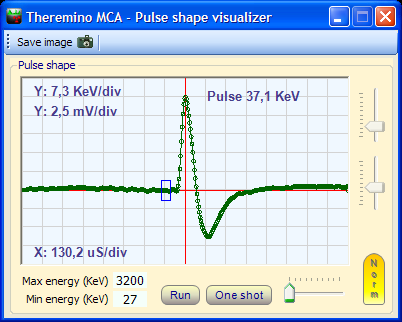 The Theremino_MCA while being completely Freeware and OpenSource is a true multi-channel-laboratory Analyzer. 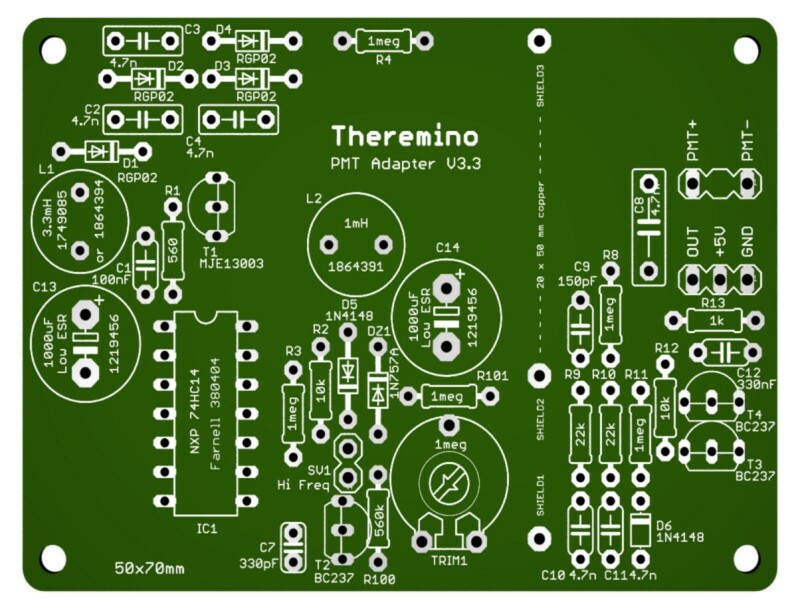 The Theremino_PmtAdapter contains a feedback loop that can keeps the tension stable even in the presence of strong temperature fluctuations. In this way the calibration remains accurate over time and rows of isotopes do not move and do not expand. ATTENTION: For optimal performance use pipes PMT wired as shown in the file PmtAdapters.pdf – PMT for low impedance tubes (with resistors 1 Mega or even from 560k) cannot operate with these adapters. 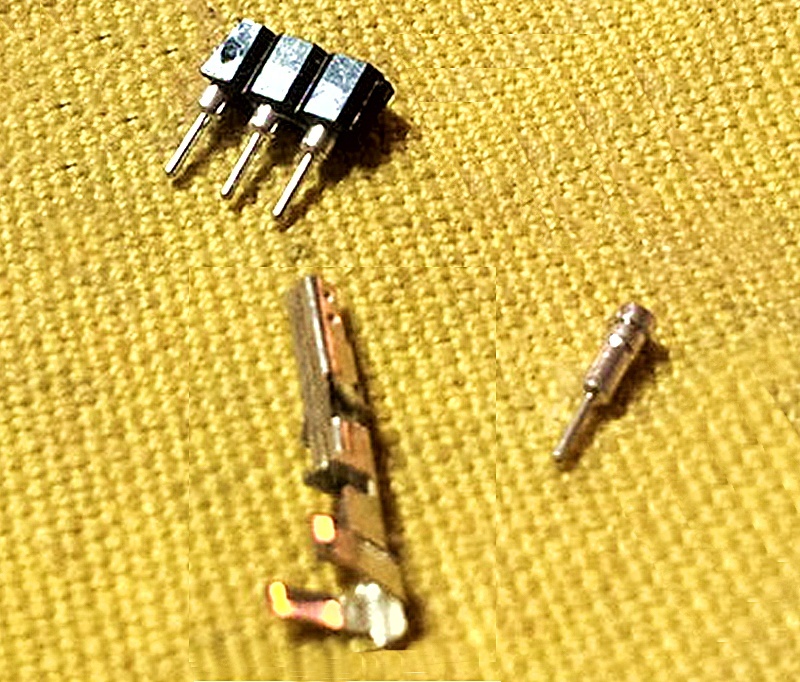 To use them you should replace their resistors, as indicated. 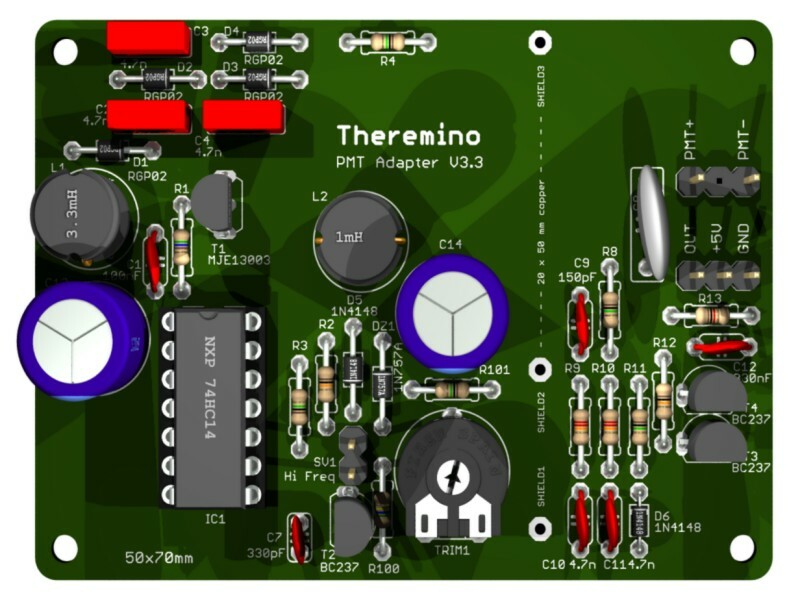 This adapter can be used with the well known freeware software PRA (We thank Marek Dolleiser for having paved the way for this kind of analysis, its software PRA is a reference for many years and helped a lot) but only with the Theremino_MCA you can do filtering and deleting useful background to get maximum information within a reasonable time. 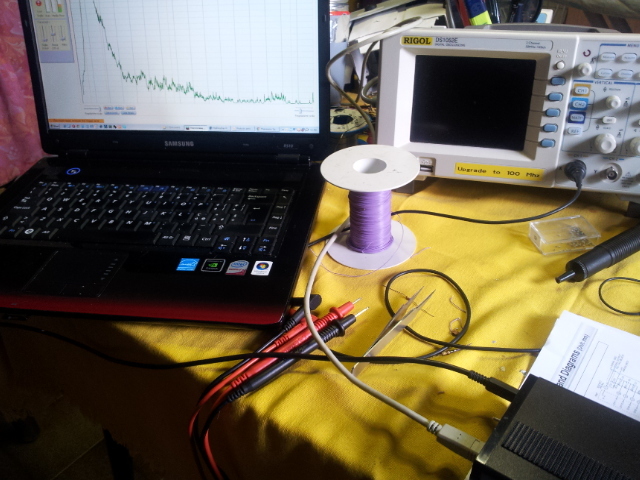 – No initial thermal drift thanks to the feedback circuit. The simple and neat reduces manufacturing defects and makes them readily apparent. In the following pictures you see the PMT in rehearsal. The circuit diagram and an impulse to sample that shows the noise level of ’ power supply, Note that this is a low-energy pulse. 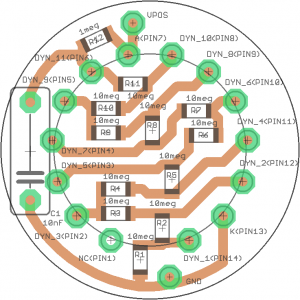 In the latest versions of PmtAdapter noise is less than 100uV. 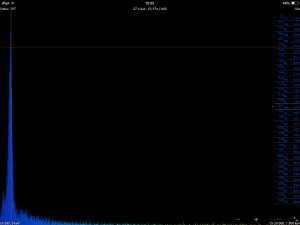 Practically the only noise due to sampling in 16 bit soundcard, as shown in the two following images. The first picture shows only noise sound card, the second noise with a separate connected. The capacitor might also be welded across (with two insulating sleeves on leads) and, to avoid short circuits with the outer aluminum tube, It is good to wrap the whole area from PMT to printed circuit board, with a sheet of plastic sheet..
By popular demand Alessio has designed a special version of PmtAdapter, usable with software available on iPhone and iPad. The software is called Geiger bot, ed è un riferimento per la comunità Apple. 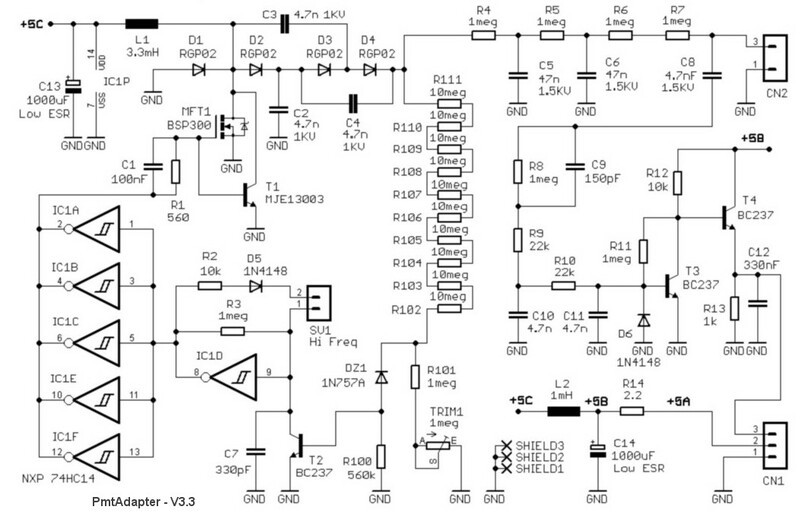 The circuit diagram is very similar to PmtAdapter for PC, but I added a battery (There is the ’ USB powered). The signal amplitude is reduced considerably, You can send all ’ mic input, that otherwise would saturate and would distort the pulse shape. 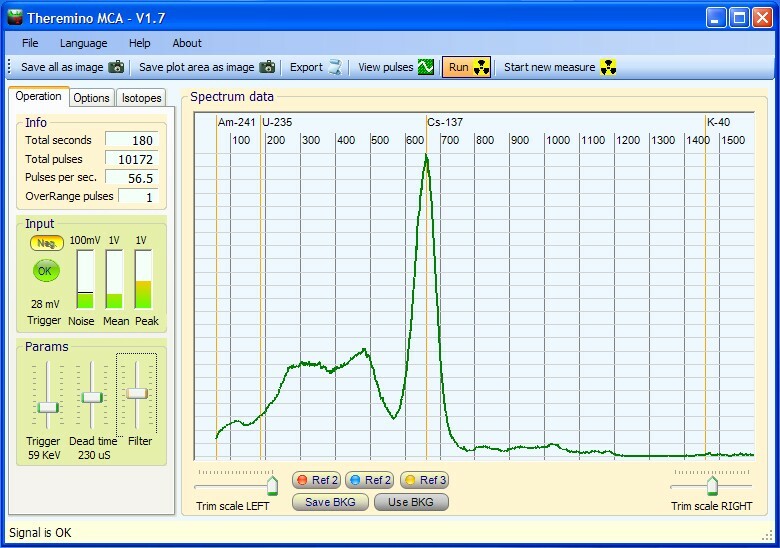 Here you can see the spectra obtained with Americium and cesium. Thanks to the wonderful display resolution “retina”, the words are so small, that do not disturb the vision of the beautiful black background. 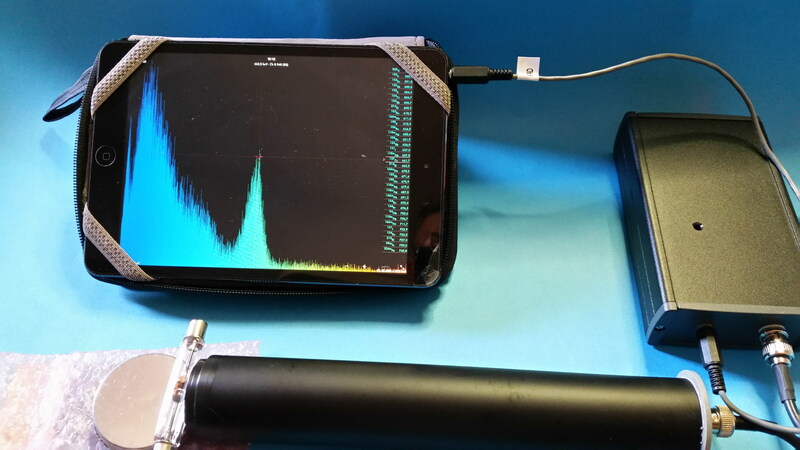 With a Tablet 12 inches by 180 Euro (with Windows 10 and shipping included in price), you would have a portable instrument much more convenient and accurate. But the satisfaction of using an Apple system, It costs an exaggeration, is priceless! 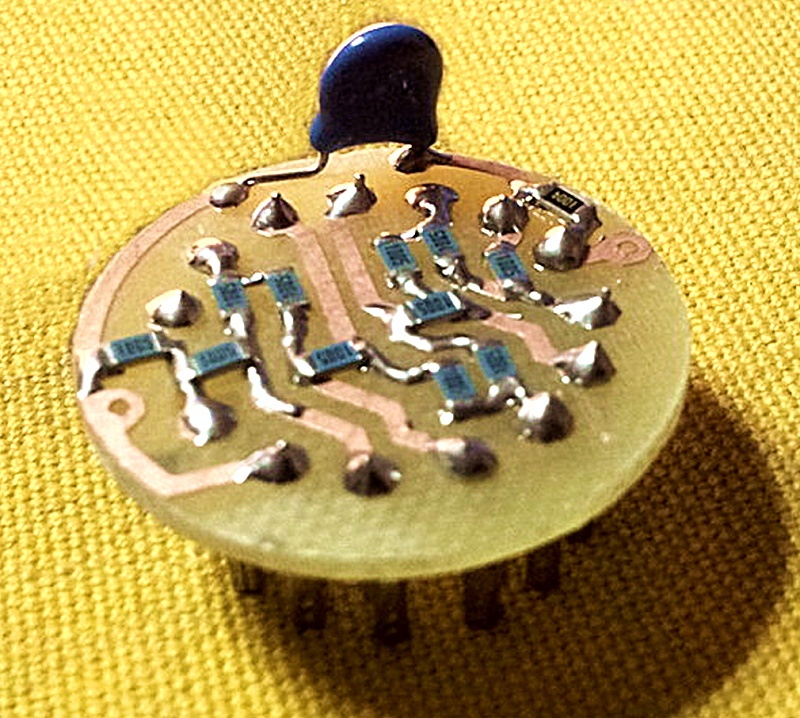 The Pmt Adapter and the photomultiplier consume only a few tens of milli Watts, that are insufficient to cause significant temperature variations. So you don't have to wait for a “warm up time” between the ignition and the measures. And there ’ is not even a progressive warming during very long measurements. 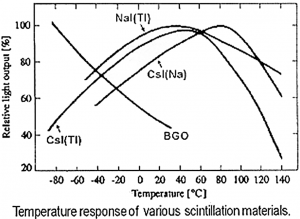 Note that the response to temperature is not linear and that changes even slope from positive to negative, right in the area of normal temperature. Whereby an automatic correction would be inaccurate. It would take a correction table to be calibrated for each Crystal and this would be very complicated and ultimately unreliable. Much better make an adjustment with two markers before each measurement. Check with the marker before each measurement is quick, accurate and very reliable. It is recommended to keep in place two small samples (for example, Caesium and Americium) at appropriate distances, so you always have two small rows of reference. Caesium is weaker and you hold it close enough to the probe while l ’ Americium hold about ten centimeters, or is enclosed in a capsule, to decrease its activity and keep him close to the probe. The two lines should be the same height and small enough not to disturb the measurements. If you do not have to measure precisely the cesium and l ’ Americium, then the two markers can always stay in position. See their lines on the final chart (possibly commented) from the security that the chart is perfectly calibrated. 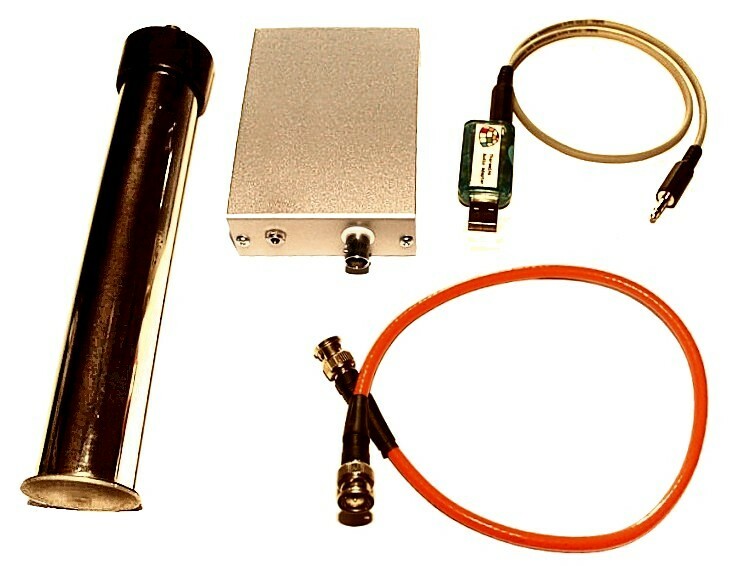 To use to measure the level of radioactivity and radioactive substances, natural background. 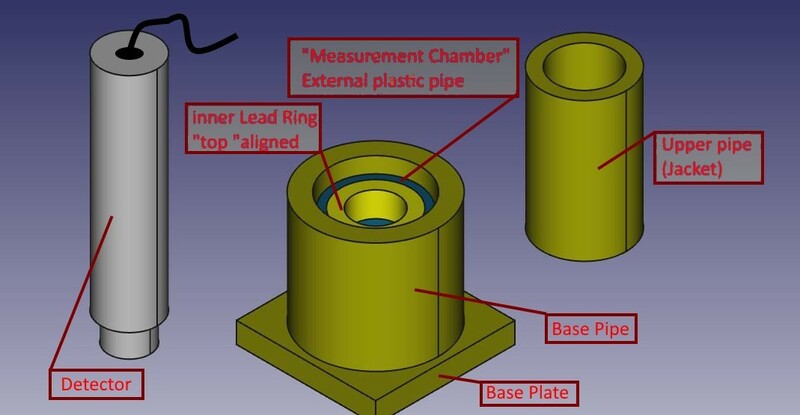 The measure consists of a base plate, plus some concentric cylinders, of various sizes and thicknesses. Among the components leaves something’ of slack, in order to facilitate the Assembly ’. 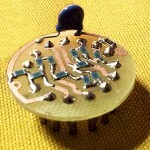 The material is actually brass lead, to distinguish it from the ’ probe grey aluminium, While the piece of inner cylinder (barely visible) is the unique ’ of plastic, with concentric ring in lead. All the lead parts were made from sheet metal 1,5 mm thick, cut with a common Bill-sheet and shaped by hand, wrap around cylinders of aluminium/steel/plastic I had available (used only as “DIME”). The base plate is made by folding several times a strip of sheet metal of equal width, getting a decent thickness. Sheet bends easily around the straight edge of a table and flattens with hammer taps. The lead is very malleable. You insert the probe : in my case straight draw in ’ ring of lead measuring nursery. 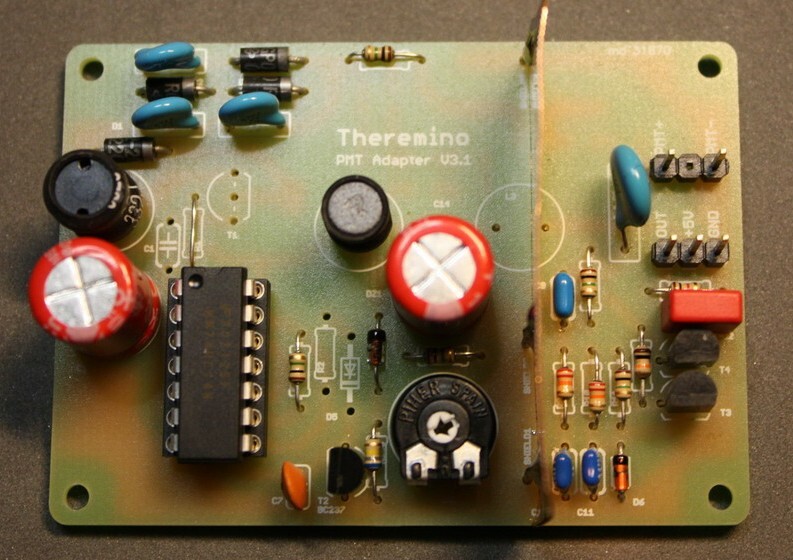 With the theremino you could build something very similar and with the same performance. Unlike the device you specified does not have an LCD Panel and buttons but you'll need to use a Tablet with touch Screen (or a desktop for laboratory measurements). The device that's already shown promise heaven and Earth but “forget” explain that the reality is much less pleasant than it looks to read its features. First of all these devices seem to measure towards the front but are not at all keys. More go next to the stream with the tip and more mark, all there. But if it turns sideways and go next to the stream with the tip mark equal. If the source is small enough that you go to a meter and do not score nearly nothing left. If it is large (for example all around you) then you turn around and you're still measure the same. 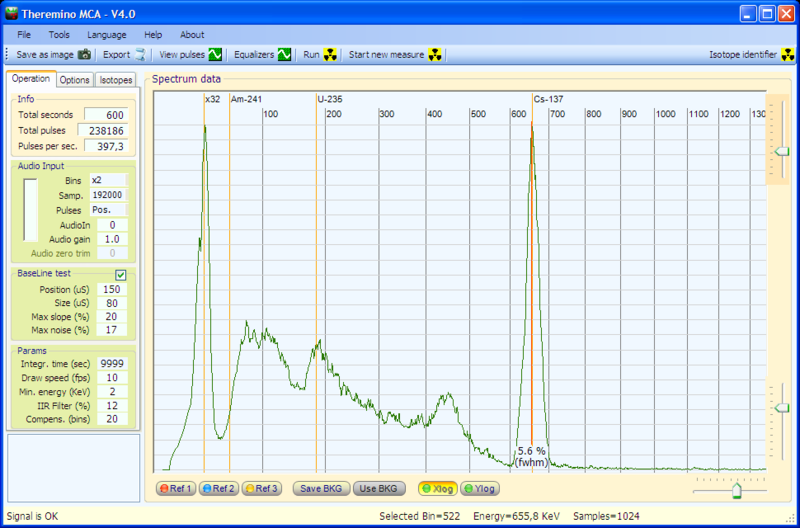 Another aspect which does not appear to read what they wrote is that sensitivity to low radioactivity you pay with time. 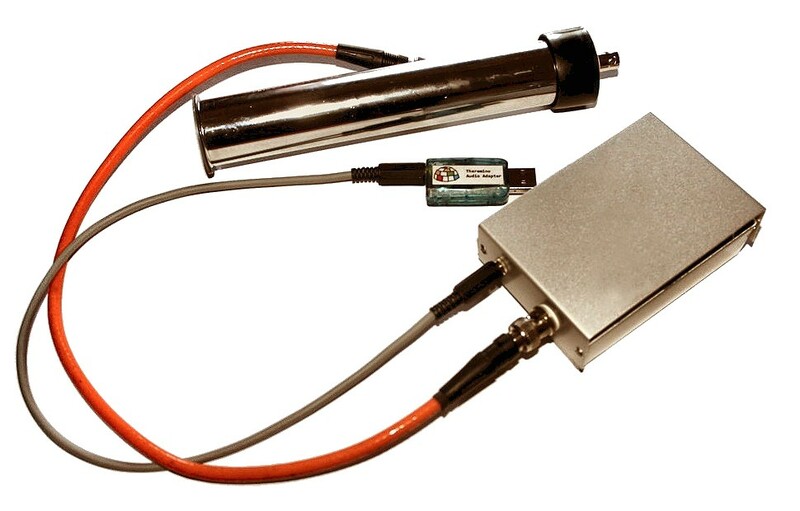 To measure low radioactivity, just above the bottom environment then we go around with beautiful handle that show in their image but the power is switched on and you leave it idle for an hour before having steps reasonably accurate. It would be different if you worked in a nuclear power plant and go around with the suit. In this case you could make rapid measurements, Let's say thirty seconds. But I don't think that's the case. Finally, it must also be said that the isotopes that normally can be found are four or five. The other hardly can find out from a central or by medical laboratories. And it also takes a lot of experience to understand something reliable by specters. So if you do it to learn it's fine, But if you plan on using it actually things change. Things to study for months or years and eventually measure more or less what there was to be expected. A little’ of caesium in environment, some sample testing and no more than useful. Hello Livio, and thanks for the reply, about the aesthetics of the project doesn't interest me much but more than anything else the substance ... I go straight to the problem so you know what it is: I would like to locate nodes Hartmann. In his book "the health of the Habitat" nuclear physics professor Katie Lamkin (He taught at Harvard Univ. and La Sapienza of Rome), explains how he discovered the nodes hartmann,(what feasible so far only from psychics with chopsticks) with an infrared thermography or with a nuclear spectrometer probe in German (He also used the CERN in Geneva and of ENEA) or Geopotenziometro (I don't know ...). 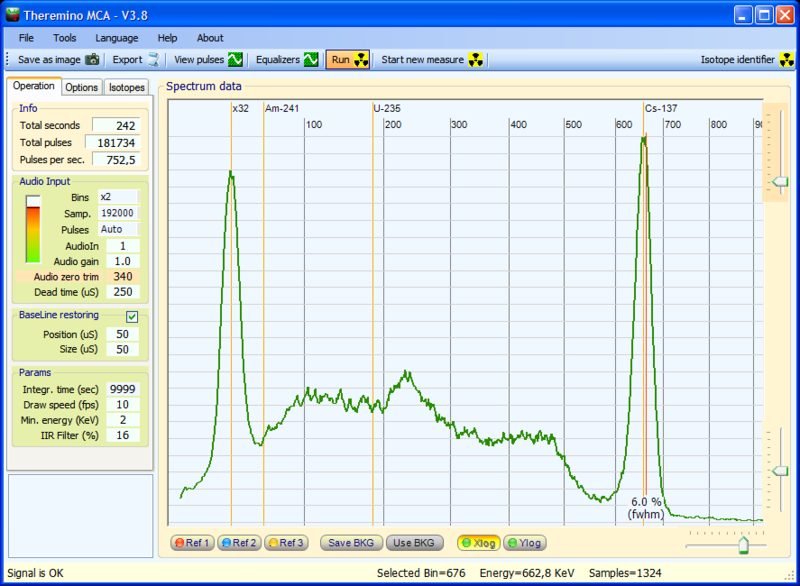 at those points found an ionizing gamma radiation, very weak one micron thickness of radio226. This radiation potratta for hours can create very serious diseases and geopatologie, and the only place where we're so many hours is the bedroom, so it would be good to revisit this area with this tool. Also if I remember correctly the potassium-40 influence much the thyroid and could see even with a thermal imaging to the hundredth of a degree that this radiation produced a hypothermia, Although very weak. The spectrometer reported to me with a link is one of that used by him,If I understand correctly, What I'm asking is if it's worth diving into this venture that fascinates me. I mean I could build with an undisclosed amount too much expensive (also a few hundred euros) a similar tool? (to Lamb costs over 30,000 and) or the detection could be an arduous task since the network with these nodes are spaced approximately 2 m and placed in an area of a few mm or even microns!? You can build it with less than 300 Euro. Ask to Alexei for greater precision. 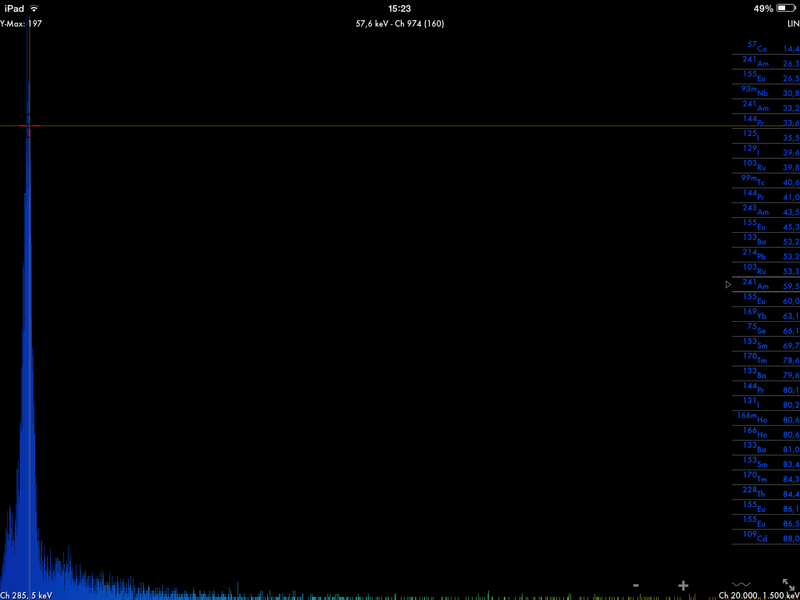 In my experience you'll measure not nothing significant, just noise and random events. But history is full of things thought impossible that then were true, so if you really care about it you should try it. 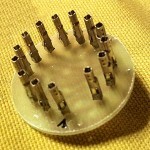 In the first case (The geigeradapter) it depends from the Geiger tube used. In the second case (A separate) it depends from the gaussian shaping circuit that produces pulses of about 100 uS. 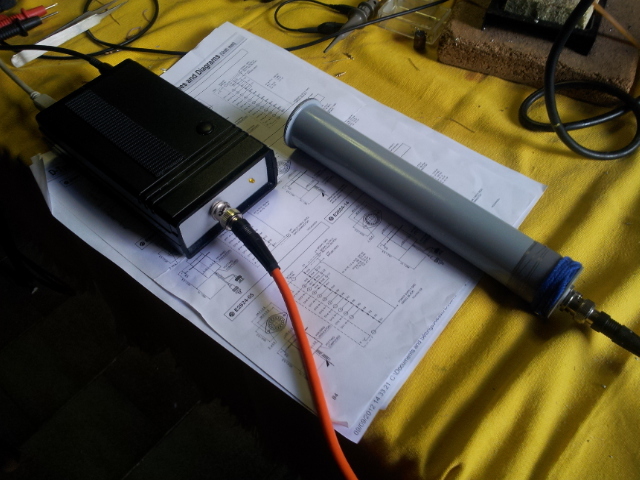 I write to ask information regarding the use of a scintilaltore (CsI:TL) con Theremino MCA. Basically I would use the scintillator together with a circuit (input_to_MCA) pulling out, for each event that is “spring” the diode, of bell curves without the use of the PMT. 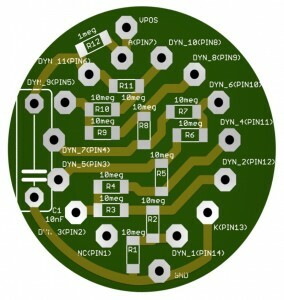 The noise is much greater than scintillators and photomultiplier, whereby under the 200 Kev does not measure anything. 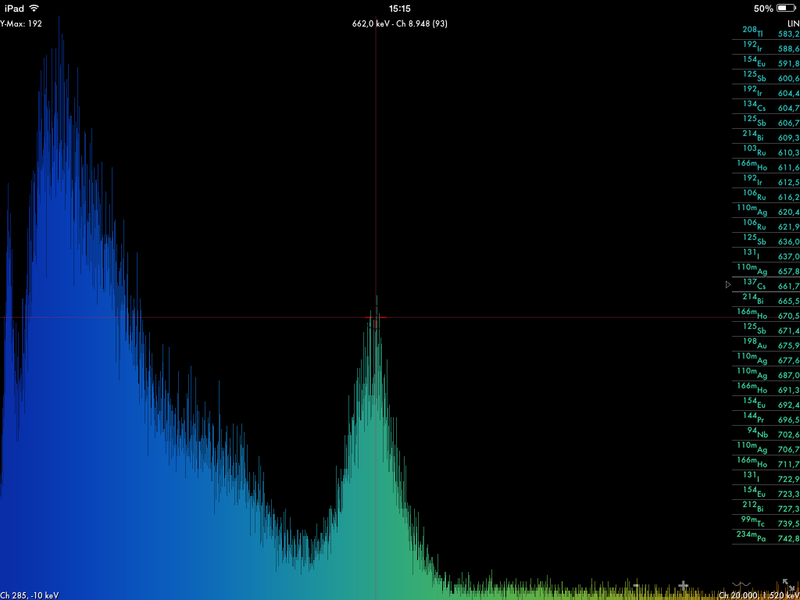 In addition the sensitivity (number of pulses per second) It is lower and thus the analysis time lengthens. Thank you for the comprehensive response. 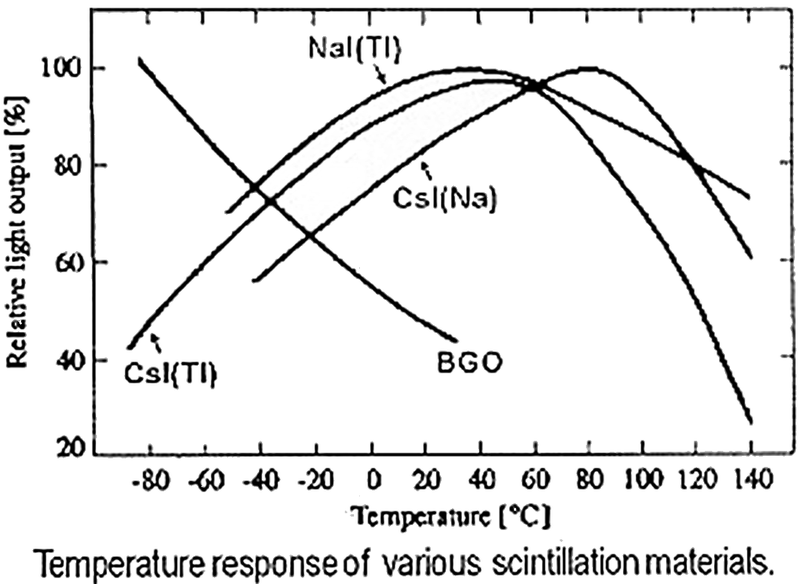 Then, If I understand, My scintillator may be used with your PMT ? I do not is very clear width of at least 100 uS: in this way does not increase in a consistent way the “downtime” …or I can lose a lot of smaller width pulse ? Not "with our PMT" but with our application MCA. Instead, the PMT (photo multiplier tube) It should be used with crystals scintillators NaiTL, not with the photodiode. By expanding the pulses in 100us not "get lost ones of a width". All pulses are narrow but they are all extended from the conditioning circuit. What is lost are some impulses that were too close together. 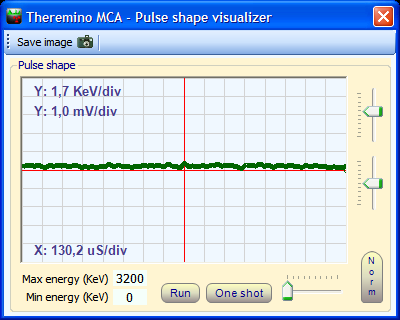 So if the radioactivity is too much, pulses per second are too many and no longer able to make good graphics (It does not count how many pulses are measured, counts only the shape of the spectrum peaks). 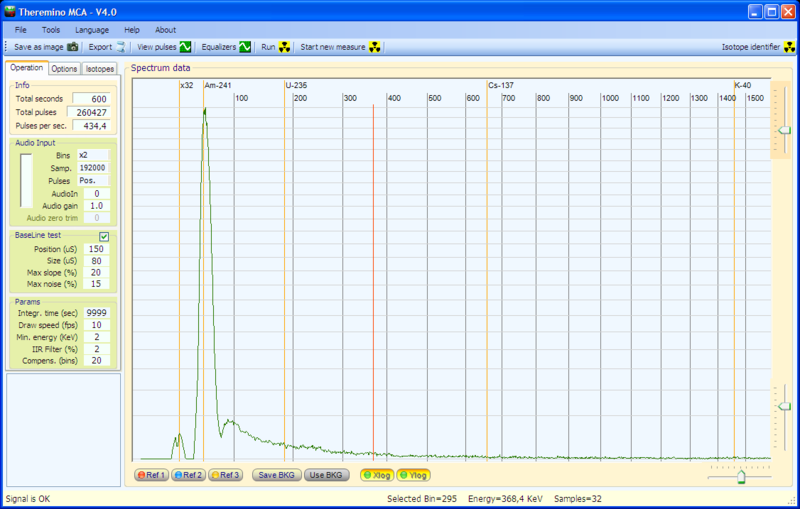 So with 100US you can not measure high radiation, but so in those cases rather than measure it escapes. In normal cases it has a very low radioactivity and the problem of losing pulse does not exist. Anyway, in this analysis what matters is to do a good spectrum, not to collect all pulses. Many impulses (when they are oddly shaped) they are discarded on purpose to have a more precise analysis. If you had one too radioactive sample, that too many pulses and ruin the spectrum, just move it away a bit '. But in reality the samples are always too weak, They make a few pulses per second and force you to very long analysis times. Hello, maybe my question is not very relevant to this blog… but do you think there is any way to measure the so-called bio photons emanating from the body? Having examined and studied by the scientist Popp? The biophotons can be detected with a photomultiplier, or by means of a low noise CCD camera to produce an image, using an exposure time of about 15 minutes for herbal materials. 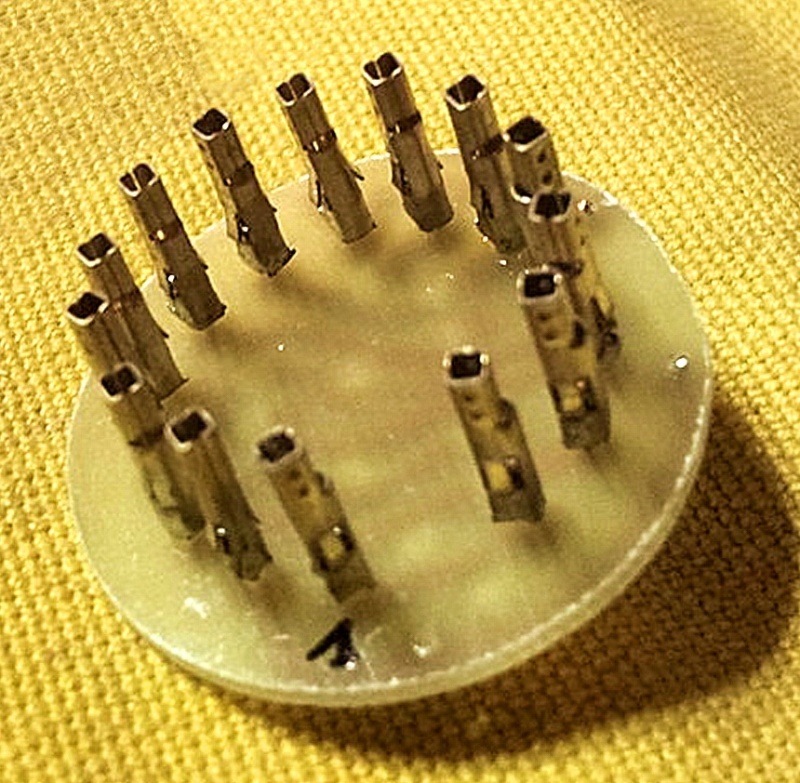 The photomultiplier tubes have also been used to measure emissions of bio photons from fish eggs and some applications have measured biophotons from animals and humans. The difficulty of extracting and analyzing the purported effects of any biophoton among other numerous chemical interactions between cells makes it difficult for the elaboration of a testable hypothesis. … An article in the 2010 review discusses various theories published about this type of reporting and identifies some 30 experimental scientific articles in English in the last 30 years that show evidence of electromagnetic cellular interactions. 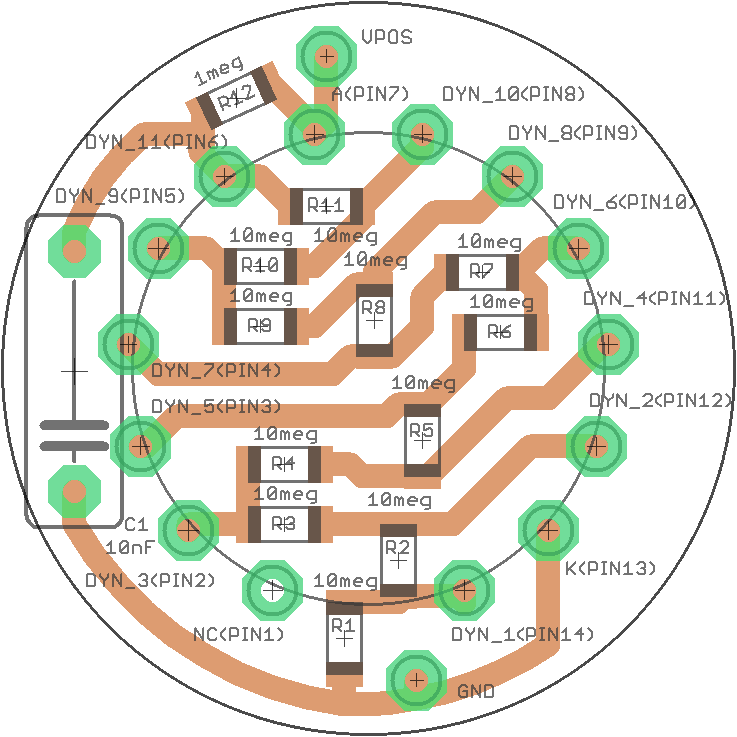 A photomultiplier used in accordance with our plans would measure not anything because we connect to count, and measure the energy, of single photons. This is possible because the X-ray and Gamma have energies a million times higher than the photons of visible light or ultraviolet. So each photon range gives us a strong electric pulse, that, however, we find it hard to measure and to distinguish from the noise. 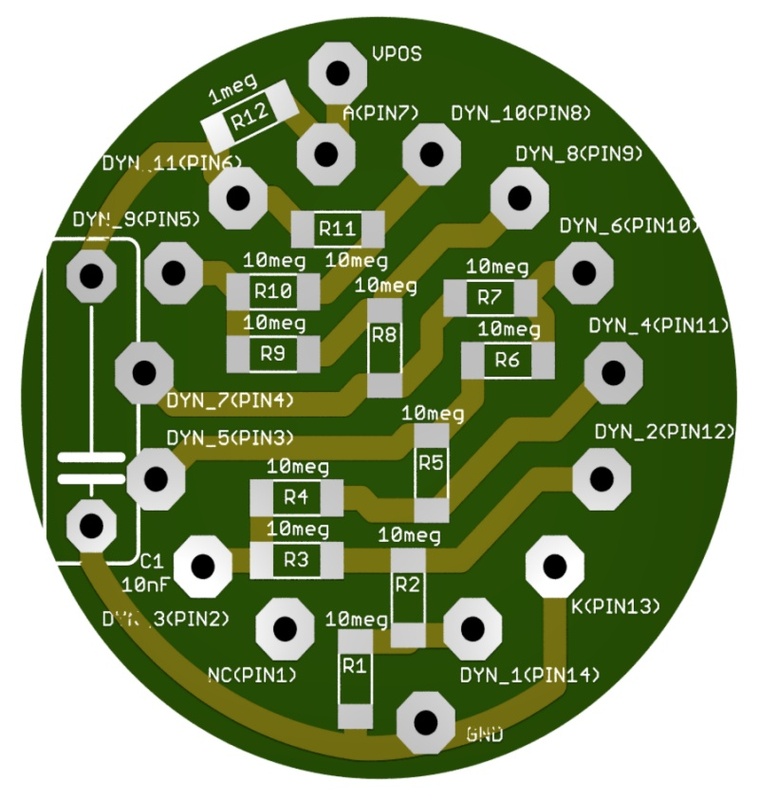 To measure biophoton the photomultiplier should be connected and powered in a way similar to our schemes, but the output signal would be a variation in voltage on the cathode which should be measured with analog circuits. 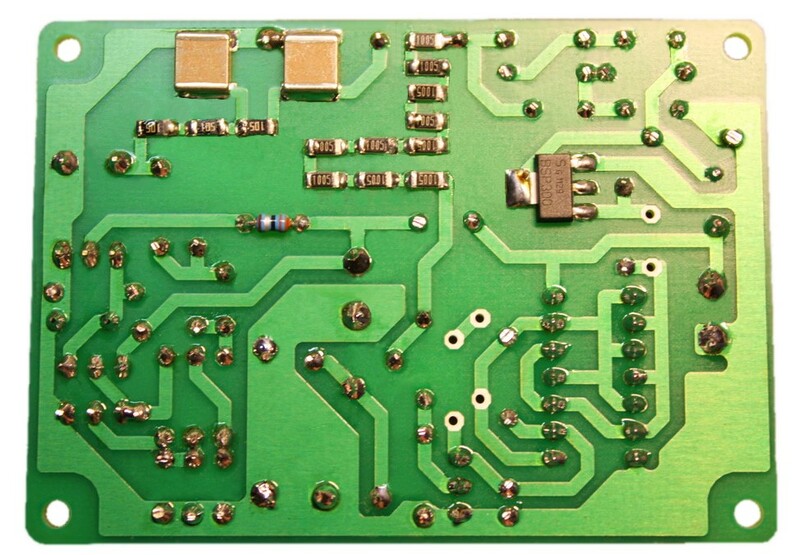 And since the signal would be very small, both the supply voltage of the tube, that the measuring circuit of the cathode voltage, They should be particularly stable. Moreover, the measures should be made in total darkness, a darkness that is difficult to reach if not in special rooms. He thinks that the light emerging from a closed PC that inside has a small, invisible LED on the motherboard, It could be thousands of times stronger than levels to be measured. And that what filters through a lock of a door even millions of times. And finally, important, photomultiplier tubes should always be kept in total darkness, otherwise they will ruin irreparably. 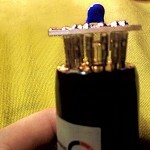 If they take a while’ light (it only takes very little), become so noisy as not measure anything. And then there are days in total darkness to recover. Also photomultiplier we use we are like clubs than newfangled photonic available the most advanced science. I do not even know what you could use, probably CCD cameras cooled to liquid helium, or high-purity germanium detectors, or other similar toys that just press the ON button, you already get thousands of euro of expenses, not to mention what it costs to build them. 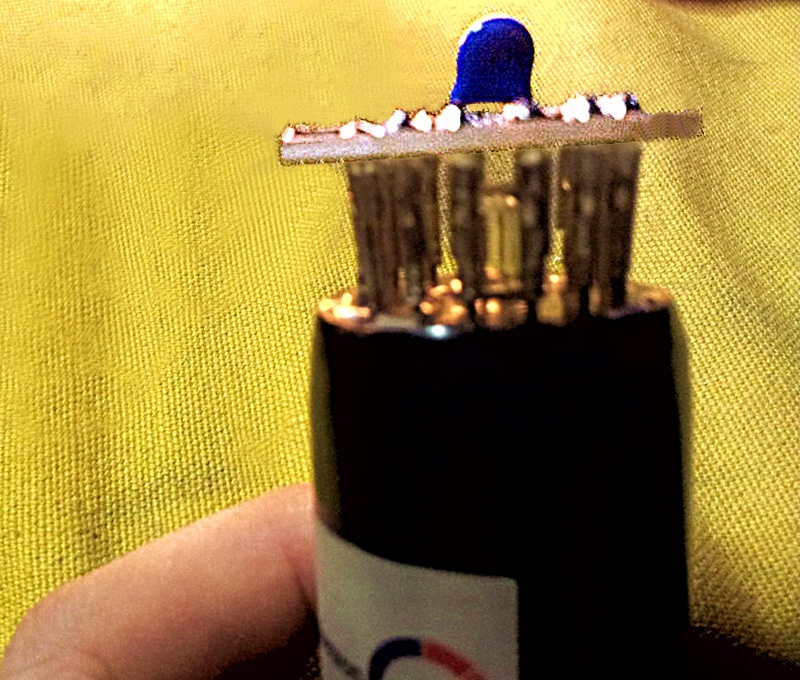 In conclusion, I do not recommend to buy a photomultiplier, plug it in and try. Because even in the best case the maximum that you can get would be to validate the existence of these radiation, so nothing new. Tens of laboratories have confirmed that there are, and they made much more precise measurements of what we could do ourselves. 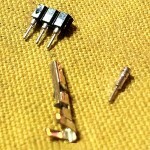 All this would be done on paper and only after you might think to touch any electronic component. If you take this route then you will know much more about us and then it will be you to come here to write what components should be used and what results we should look to validate your hypothesis. Ok, I realized then it is not really within my reach, Livio Thanks for the answer.